There are more mobile devices than people in the world. Most likely, you and other federal employees are completely comfortable navigating life around a personal smartphone. More than three quarters of Americans do — using it for everything from reading to connecting with friends to tracking your health. 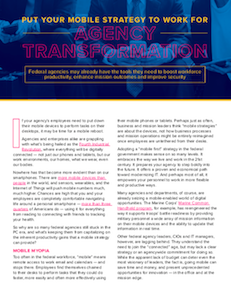 So why are so many federal agencies still stuck in the PC era, and what’s keeping them from capitalizing on the inherent productivity gains that a mobile strategy can provide? What may be surprising: Your agency may already have the available mobility tools needed to boost workforce productivity, enhance mission outcomes and improve security, according to a new special report on mobile strategies in government. Too often in the federal workforce, “mobile” means remote access to work email and calendars — and stops there. Employees find themselves chained to their desks to perform tasks that they could do faster, more easily and often more effectively using their mobile phones or tablets. Perhaps just as often, business and mission leaders think “mobile strategies” are about the devices, not how business processes and mission operations might be entirely reimagined once employees are untethered from their desks. Adopting a “mobile first” strategy in the federal government makes sense on so many levels. It embraces the way we live and work in the 21st century. It prepares your agency to step boldly into the future. It offers a proven and economical path toward modernizing IT. And perhaps most of all, it empowers your personnel to work in more flexible and productive ways. Many agencies and departments are already seizing a mobile-enabled world of digital opportunities. Where mobile technology is embraced, employees tend to be more engaged, according to research cited in the special report. But modern mobile devices also give agencies something else: security features that in many cases offer greater data protection than traditional PCs and laptops. Some of these advanced capabilities include derived credentials and biometrics that confirm who is logging in; behavioral authentication for continued verification during use; “containerization” to digitally and physically isolate sensitive work from personal apps; and more. If mobility makes workers more productive, the inverse is also true: Productivity suffers when organizations fail to equip their people with the tools employees need. That’s one reason why the White House “Report to the President on IT Modernization” specifies mobile technology as a priority. As the report makes clear: “The existing … approach to IT is no longer sustainable in an increasingly mobile, cloud-based, and complex digital world.” Agencies that have embraced the mobile movement are already enhancing their workers’ productivity. Moreover, a delay in embracing mobile technology comes at a cost, the report concludes. Today’s mobile tools allow instantaneous, wireless configurations and customizations that can automatically meet agency specifications the second their users turn them on. That removes a significant burden from IT personnel who performed this task in the past, reduces overall support costs and gives time back to your IT specialists to focus on more critical tasks to the organization. Multiply that times hundreds or thousands of personnel devices and the cost savings and productivity benefits of over the air configuration grows exponentially. The hesitancy to adopt modern mobile technologies also presents new risks. Employees, frustrated with aging tools at the office, are literally taking matters into their own hands and using their personal devices and apps for work — creating a growing concern about attacks coming from unsecured devices accessing agency networks. The good news is, many agencies and departments may already have the mobile device management tools they need to upgrade their capabilities and are just not taking full advantage of them to protect their data. Assess what the market now has to offer. Download the report, “Put your mobile strategy to work for agency transformation,” for more on benefits of putting a mobile strategy to work.